Natural face moisturizers are the next very important step after cleansing. Now that you have gently cleansed all the impurities and toxins from your skin, it is ready to be moisturized and nourished. Using natural ingredients to moisturize your face will give it everything it needs to stay healthy and young. Below is a list of natural ingredients that are excellent to include in your natural face moisturizers because they are packed full of nutrients that your skin will love. Avocado is an ingredient that should be in everyone's skin care routine. Not only is it an excellent moisturizer but it heals, regenerates, tightens and nourishes skin. This moisturizer is excellent for aging skin. Honey is a very effective moisturizer and a very good choice for dry skin. It also has the added benefits of healing properties. Aloe Vera is a very well known moisturizer and gentle healer. It can be put directly on the skin or it can be put in favorite facial moisturizer recipe. Aloe vera has a very cooling soothing effect. Beeswax is an ingredient excellent in your natural moisturizer because it seals moisture in to your skin while still allowing it to breath. Coconut Oil is effective in treating dry skin among other skin conditions. It has excellent healing properties. Cocoa Butter promotes elasticity in the skin and can even prevent stretch marks. Coconut Milk moisturizes and is high in natural fatty acids which are vital to healthy skin. Essential Oils Geranium, Lavender, Chamomile, Rose and Sandlewood Oils are all good soothing moisturizers. 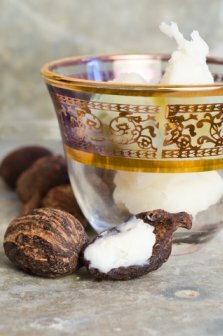 Shea Butter has essential fatty acids and is an extremely good moisturizer. Use these ingredients when making your own moisturizer, or purchase natural skin care products that include them. Always be sure to check labels and ingredients when purchasing your natural skin care.